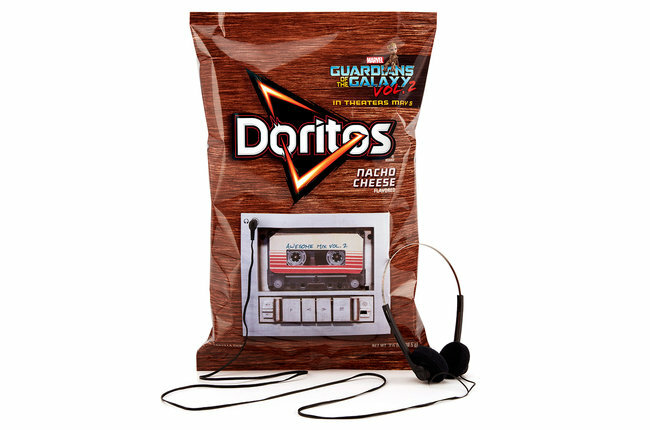 3 Things In This World That I Love Are are The Guardians Of The Galaxy, 80's Music And Doritos. And Now They Are Being Combined! I loved the soundtrack to the original Guardians of the Galaxy movie! The producers did an incredible job picking some of the most iconic 80’s music that fit the right mood at the right time of the film. They even stayed true to the film by releasing it on cassette! Well they found a way to one up that for the sequel with a new form of media to release the soundtrack on: Doritos bags! The limited edition bags will be available on Amazon beginning May 5th and will feature a headphone or aux style plug in to listen to the entire Guardians of the Galaxy Vol 2 soundtrack. The bag is even rechargable! And yes, the Doritos chips are included. Here is the Guardians of the Galaxy Vol 2 set list. The soundtrack from the first Guardians of the Galaxy movie finished 2014 as the top selling Billboard 200 album, making it the first soundtrack comprised entirely of pre-released music to do so. I will update this article with a link to the Guardians of the Galaxy Limited Edition Doritos Bag when available on May 5th! Previous Are Jedi The Absolute Worst Mentors In The Galaxy? I am super geeked about it too! Can’t wait! !